Step 1 Place the lentils in a small saucepan with 2 cups of the water. Bring the water to a boil over high heat, and then reduce the heat and simmer, cover until the lentils are par-boiled (10-12 minutes). Remove from the heat, drain the lentils and set them aside. Step 2 In a large saute pan with a lid, heat the oil over medium-high heat. Add the diced onions and cook until the onions are dark golden brown, darker than typical caramelized onions (about 40 minutes), sprinkle the onions with a teaspoon of salt as they cook. Step 3 Carefully pour the remaining 2 cups of water, bring the water to a boil over high heat, and then reduce the heat to low and simmer for 2 minutes. Stir the rice and par-cooked lentils into the onion mixture. Cover and bring back to a boil. Stir in a healthy pinch of salt and the black pepper. Reduce the heat to low, cover, and cook until the liquid has been absorbed and the rice and lentils are both cooked through (about 20 minutes). Remove from the heat and season with salt and pepper to taste. Serve the Mujadara hot or at room temprature with a drizzle of extra virgin olive oil and parsley garnish, if you like. Step 4 If you are adding the the fried onions, heat the oil over medium-high heat (to 375 degrees F) in a saucepan. When a small piece of onion bubbles vigorously, the oil is ready. Fry the onions in batches until they are golden brown. Transfer the onions to a paper towel-lined plate or try, and then arrange them on top of the Mjuadara. Step 5 Add a side of salad like fattoush, if you like. Enjoy! – The original recipe does not call for soaking the rice in water before use. I have found that soaking the rice in water for 10-15 minutes, or until you are able to break one grain of rice between your fingers, provides better results. 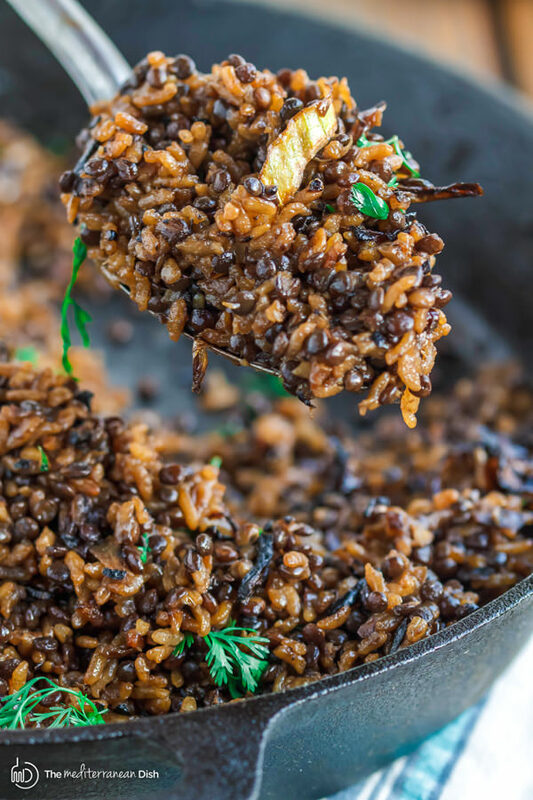 – If you choose to add the crispy onion garnish, to save time, you can start this while the rice and lentils cook. Mujadara (mujaddara) is a signature Middle Eastern dish of lentils and rice garnished with crispy onions. I am especially excited to share the Lebanese version of this dish from Rose Water and Orange Blossoms!